Mika Roinila, a native of Helsinki, holds a Ph.D. in cultural-historical geography from the University of Saskatchewan. His dissertation, Finland-Swedes in Canada: Migration, Settlement and Ethnic Relations, was published by the Institute of Migration in Turku. Roinila is a professor and currently teaching at the State University of New York at New Paltz. The fishing industry on the Great Lakes has declined dramatically since the influx of Lampreys in the 1960s. Prior to this period, many commercial fishermen had enjoyed years of success in the cold waters of Lake Superior. Among these fishermen were Finns, who had settled in many locations around the shores of the Lake, including the Upper Peninsula of Michigan and the western shore of Lake Superior. This article briefly explores the Finnish fishermen of Lake Superior, both Finnish and Swedish-speaking Finns, their historic settlement to the area and the commercial fishing operations that were well respected by the regions communities. It is ironic, that while fishing has occurred along the shores of Lake Superior, sometimes well before the growth and development of other industries  such as mining very little documentation is to be found in literature. From examining books for any information on Finnish fishing industries, it becomes apparent that most authors have not included this industry at all (Holmio, 2000). Only a few bits of information is available, and even these are sketchy. The earliest Finnish fishermen on the US side of Lake Superior arrived with the great wave of Finnish immigrants in the late 1800s. Some of the known locations on the American side include Larsmont, Minnesota, which was named after the town of Larsmo in Finland. Originally settled in 1909 by Finland-Swedish fishermen, some of the fishermen included the Sjoblom the Hendrickson families, who sold their catch for market in Chicago (Sjoblom,1998; Strandberg,1995). There is no longer any active commercial fishing taking place at Larsmont. According to Margaret Bogue (2000), the Finns had a prominent fishing outpost at Portage Entry on the Keweenaw Peninsula (83). Damage and pollution from the developing mining industry in nearby Calumet and the Keweenaw Peninsula in the early 1900s had a negative impact on the fishing industry. Hard times fell on the village of Craig, at the mouth of the Portage River, where in 1885 thirty to forty families, including sixty-four fishermen lived. Settled primarily by Finns, it was the only settlement in the area where any considerable percentage of people were interested in fishing (Bogue,130). Other notable fishing ports with Finns were to be found in Grand Rapids, Lutsen, and Two Harbours in Minnesota, in Superior, Wisconsin, and in Calumet, Copper Harbor, Traverse Bay, Dollar Bay and Marquette, Michigan (Myhrman,1972). According to Carl Silfversten (1931), Finland-Swedish fishermen were also found in areas such as Ontonagon, Michigan, Duluth and French River in Minnesota (Strandberg,1995). It is widely believed that the earliest European fishermen began to fish the Ontario side of Lake Superior in the 1890s (C.Westerback,1996). However, it was not until the 1920s that official records on commercial fishermen was begun (Giddens,1992). 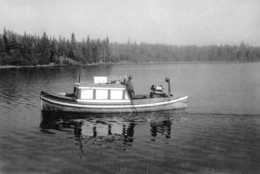 According to John and Carl Westerback who arrived in Rossport in 1926-27, many Finland-Swedes were employed in commercial fisheries, using gill nets and pound nets to catch whitefish, herring, trout, pickerel, pike and smelt in Lake Superior. The Finland-Swedes used old row boats, converted lifeboats, as well as tugs for their work. Lifeboats were converted to fishing boats by adding a cabin and a small engine. Seaworthy wooden skiffs were fashioned from local materials and former pleasure crafts were also made into fishing boats. Some twenty individuals moved from the fishing stations at Rossport to the tip of Sibley Peninsula and established their fishing stations at Camp Bay and Tee Harbor. Among these were the Westerbacks, as well as Gunnar Ingves and Roy Hedman. 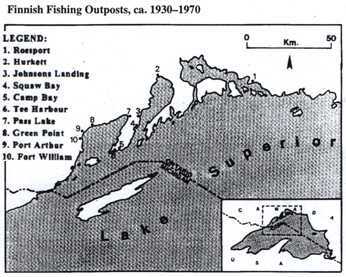 Other fishing stations also developed along the North Shore of Lake Superior at Port Arthur/Fort William, at Squaw Bay, Johnson Landing, Pass Lake, Hurkett and elsewhere. While many Finns and Finland-Swedes worked from these fishing stations during the fishing season, families returned to their homes in Port Arthur and Fort William for the winter months (Figure 1). 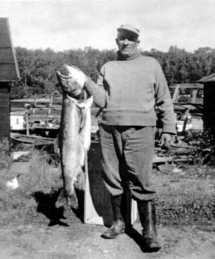 Gunnar Westerback was one of the old-time Finland-Swedes who brought their fishing trade and knowledge from Finland to Canada in the 1920s. This knowledge was passed on to the second generation, and in 1947 John Westerback began fishing as well. 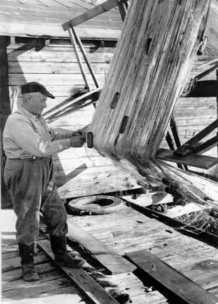 Figure 2: Gunnar Westerback reeling gill nets, Camp Bay, Lake Superior, 1961. Photo of Carl Westerback, by courtesy of the Institute of Migration. Figure 3: Vern Erikson with the boat "Sea Scout", at Point Magnet, Lake Superior, 1956. Photo of Carl Westerback, 1996, by courtesy of the Institute of Migration. Figure 4: Gunnar Westerback, Silver Island, Lake Superior with prize Lake Trout, 1957. Photo of Carl Westerback, by courtesy of the Institute of Migration. With the coming of the lamprey in the 1960s, the valuable trout fisheries collapsed, which forced many commercial fisheries out of business. Only a few remained, such as the Aijala and Sameluk families, and the Westerbacks. John Westerback, who quit fishing in 1989, spent almost 40 years as a fisherman. The last remaining fishermen today include Alf and Carl Ronquist of Pass Lake, who are originally from Kristinestad, a fishing community on the western coast of Finland. The memory of the Finnish fishermen has been recognized by a monument that stands at the shore of Green Point, just north of Thunder Bay on Lake Superior. The statue was erected in 1990 as part of the 100th Anniversary of the first fishermen to work from Green Point. The monument was built by Mr.Lindsay Eade, who is related to some of the early fishermen of the region. The Green Point area used to have a 110-foot dock which was used to tie up some of the ten or more fishing tugs that worked on Lake Superior. The Finns of Green Point would sell their fish to Kemp Fisheries located in Duluth, Minnesota, and over the years a very trusting and lasting association was formed between the fishermen and the American seller. In fact, when an unexpected thaw one winter left the fishermen with no way to keep their harvest frozen, Kemp Fisheries rented the Port Arthur Arena to freeze the fish and preserve them for market. Today, marine traffic is limited to small fishing and pleasure crafts used by the owners of the many cottages that line the shore. 1990 saw the last commercial fisherman of Green Point  Esko Kangas  give up his license for retirement. This marked the end of a long line of commercial fishing that had gone on for a century. While only the names of people who are recorded in official documents are listed on the memorial, all the names listed are of Finnish descent. The names of the fishermen are as follows: Fred Arnold, Heikki Maunula, Reino Maunula, Victor Ketola, Charlie Eskola, Edward Salmi, Wilfred Eskola, Edward Salmi, Wilfred Arnold, William Arnold, Andrew Pudas, Laurie Pudas, Walter Stenroos, Frank Lahti, Evert Pasola, Svante Wierikko, Leo Hannula, and Esko Kangas. Bogue, Margaret Beattie. Fishing the Great Lakes: An Environmental History, 1783-	1933. The University of Wisconsin Press, Madison, WI. 2000. Giddens, Grag. "Monument for Finnish fishermen", Focus 92, Vol.1:7, 1002. Thunder Bay, Ontario, p.1 & 10. Hedman, Roy. Interview, May 1, 1996. Thunder Bay, Ontario. Holmio, Armas (translated by Ellen Ryynanen), History of the Finns in Michigan,	Wayne State University Press, Detroit, Michigan, 2001. Ingves, Gunnar. Interview, Nov.1, 1996, Thunder Bay, Ontario. Myhrman, Anders M. Finlandsvenskar i America. Svenska Litteratursällskapet, Helsingfors, 1972. Prothero, Frank. "Through the years: The Finns of Thunder Bay", Great Lakes Fisherman, Vol.16:1, 1988, pp.16-21. Silfversten, Carl.Finlandssvenskarna i Amerika: Deras Materiella och Andliga Strävanden. Interstate Printing Company, Duluth, Minnesota, 1931. Sjoblom, Tom. "The Autobiography of a Herring Choker", Journal of North Shore Commercial Fishing Museum, Tofte, Cook County, Minnesota, summer 1998. Somes, Tommy. "Tiny hamlet picturesque survivor of once-lucrative fishing industry" Port Arthur News Chronicle, Thunder Bay, Ontario, October 18, 1961, p.3. Strandberg, Frans E. "Finland-Swedes in America" (translation of Silfversten,1931),	Ledstjärnan-Leading Star, Portland, Oregon. April & May, 1995. Westerback, Carl. Interview, May 1, 1996, and correspondence, Sept.18, 1996. Thunder	Bay, Ontario. Westerback, John. Interview, May 1, 1996, Thunder	Bay, Ontario.